I ran across a brilliant research article from BioMed Research International, Human Elimination of Organochloride Pesticides: Blood, Urine, and Sweat Study. Whew! The title alone is pretty intimidating! Researchers found that a large number of pesticides and chemicals are stored in bodily tissue, instead of in blood, for an alarming length of time. Along with DDT, many countries banned several of these agents in the OCP family years ago. Due to the lingering effects of the chemicals in tissue, individuals contaminated with these compounds could potentially pass them onto their offspring during pregnancy. Ongoing use of OCPs in some areas. 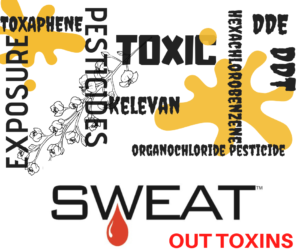 There have been numerous, detailed research studies confirming that ridding your body of chemicals, pesticides and dangerous accumulations of toxins via SWEAT is established. These studies highlighting the difference between sweat, blood, and urine proves that sweat is the number one way to diminish the burden of these harmful toxins in your body. Knowing that you can begin to detoxify and strengthen your system 2 – 3 times each week during your 30-min. purifying sessions is a great feeling, isn’t it?